Design a wedding band that you’ll be excited to wear for a lifetime. For her, choose a band that compliments her engagement ring. This halo engagement ring, for instance, pairs well with a pavé wedding band. For him, opt for a durable band with personal style, like this white gold wedding band or this platinum ring with a rose gold inlay. No matter which styles you choose, we highly recommend purchasing your wedding band from a reputable vendor like James Allen or Blue Nile—to ensure the diamonds and jewelry are of high quality. Review the guide below for more buying tips and wedding band ideas. Dating back over 6,000 years to Ancient Egypt, wedding bands signify the love and commitment between a married couple. With no defined beginning or end, the wedding band represents eternity. The first rings were crafted out of iron. And by medieval times, rings were made of gold settings decorated with gemstones. Today, wedding bands are usually made of precious metal: yellow gold, rose gold, white gold or platinum. The bands are traditionally worn on the ring finger, either the left or right hand, depending on the culture. Female wedding bands often compliment her engagement ring and can sometimes be purchased together as a set called a bridal set or wedding set. 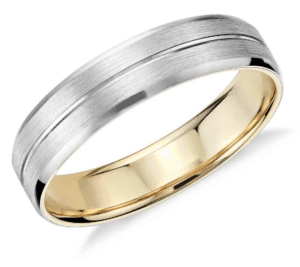 Male wedding bands tend to be more simple in style and are commonly made of materials such as white gold, tungsten, titanium and yellow gold. Similar to when you buy an engagement ring, you want to purchase your wedding band from a reputable jewelry vendor. From our extensive experience in the industry, we recommend the following online vendors. 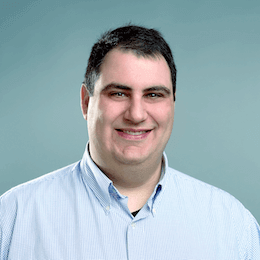 James Allen: James Allen offers superior customer service and stunning jewelry craftsmanship. Their website provides high-resolution photography of every ring, so you can confidently buy online. Their beautiful collection of well-crafted settings make them an excellent choice for fine jewelry. 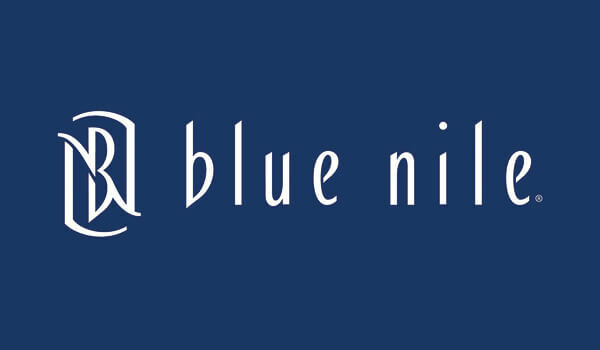 Blue Nile: Blue Nile has developed strong relationships with diamond and jewelry vendors—giving them the largest online selection of diamonds and settings. Their prices are competitive and their jewelry craftsmanship is exceptional. Brian Gavin Diamonds: Known for selling some of the best cut diamonds in the world, Brian Gavin diamonds offer unparalleled brilliance. Their collection is full of exceptional jewelry at competitive prices. Boutique options: If you’re looking for something unique and willing to pay extra, please contact us. We have connections with boutiques who can provide this extra level of service to you. 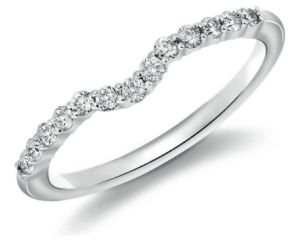 Wedding bands range in setting style from prong to pave to bezel. 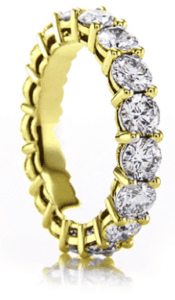 Even eternity bands are commonly purchased as wedding rings. If you’re looking to pair your band with your engagement ring, aim to match the style and metal as close as you can. The amount of diamonds and specialty details (or lack thereof) is entirely up to you. Some women prefer the extra sparkle on their wedding band, while others want to keep the attention on their engagement ring. Review several styles before making your final decision. Wedding bands for men tend to be simpler than those for women, but some include beautiful detailing and intricacies. For example, you can have diamonds embedded into your band. Or your metal can be polished, brushed, hammered or hand-braided. Choose a style that matches your personality, but also fits your lifestyle. If you use your hands frequently for work or recreation, you’ll want to keep any diamonds flush within the band. You and your spouse-to-be will be wearing your wedding bands forever. Make sure they’re made of high-quality materials so they last for many years to come. 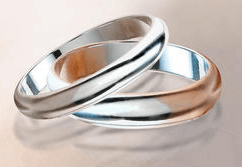 Consider these three important aspects when shopping for a wedding band: the type of precious metal used, the diamonds and the setting quality. Most wedding bands for both men and women are made with durable materials, like yellow gold, white gold, platinum or tungsten carbide. Just be sure to choose a reputable vendor who provides some type of verification of the precious metal used, so you know exactly what you’re getting. As far as the diamonds in a wedding band, they’ll be much smaller than the center stone of an engagement ring. In short, the diamonds are simply too small for the expense and time involved with grading the diamonds. For instance, if you were to certify 14 diamonds in a wedding band, the certifications would cost nearly a thousand dollars alone. Without diamond certifications, it’s especially important to buy wedding bands from thoroughly vetted, reputable vendors like Blue Nile and James Allen. In a wedding band, much of what you’re paying for is craftsmanship and style. The way the band is formed and how the stones are set significantly impact the ring’s beauty and quality. 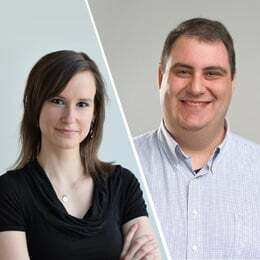 For instance, the level of the jeweler’s expertise and amount of time invested will be significantly greater with vendors like Blue Nile and James Allen—versus other companies. Overall, when reviewing diamonds in a wedding band, watch for the level of brilliance (how much the diamonds sparkle and reflect white light). Brilliance is the best indicator of beauty and quality in smaller diamonds. If you’d like assistance in reviewing diamonds or wedding bands, contact our experts. The simplest way to determine the size for a wedding band is to match the size of the wearer’s engagement ring or another existing ring in their jewelry collection. Read our full guide here to find your ideal ring size. For a beautiful, timeless wedding band, match the style and personality of your someone special. Choose a reputable vendor like Blue Nile or James Allen for your purchase. Email our experts for help in finding a stunning engagement ring or wedding band.